IN 1951, a young, half-deaf bisexual epileptic named John Alvin Ray recorded one of the greatest pop singles ever. "Cry," released over a half-century ago by Johnnie Ray, is a breathtaking example of what magic can be wrought in the length of one side of a 45 rpm record. Laying out in elongated consonants and voluptuous vowels the crippling depths of emotional despair, the song levels the heart of the tortured teenager in three minutes flat. The masterpiece of "Cry" lies not just in its economy of time but in its economy of resources; Johnnie Ray paints the entire weight of his heart onto the thinnest of canvases, with just a small group of singers and a guitar-based quartet playing all but invisibly to back up his flamboyant wails. "Cry" is razor-thin pop minimalism of the most pioneering and effective kind. Fifty-seven years later, an addictively bizarre song reached the top of the charts. "A Milli" by the New Orleans rapper Lil Wayne confounds like a 4am drug binge. How the song went from one of hundreds of tracks that Wayne recorded in 2007 to a No. 1 hit on its own is essentially the defining story of the unpredictable music industry in 2008. Even more left-field than the song's rise to prominence is its miniscule production, a direct descendant of Ray's 1951 small studio band. Everyone who hears "A Milli" immediately notices the song's namesake vocal loop, which repeats through the track like a nag, but the rest of its sounds are far less blatant: a bass drum; a sluggish, sparse snare fill that sounds like it's played by a robot on dead batteries; and stray hand-claps. That's it. Other artists have obviously taken the hint. These days, razor-thin pop production is a way for a track to stand out against the tidal wave of software plug-ins that overdecorate most 21st-century music. The future hits next year very well may be more about curating from, rather than condensing down, the outer reaches of the technological infinite. What makes razor-pop production so perfect is the illusion of humanity it presents—the sensation that the artist is singing on a street corner, with friends as accompanists. It sounds like a small party, but everyone's invited. Earlier last month, Beyoncé released her take on the razor-pop single. "Single Ladies (Put a Ring on It)" is a classic celebration of freedom, a juvenile admonishment to a loser ex-boyfriend who couldn't find it in himself to buy a ring and get down on bended knee. But the song's effectiveness resides in its sparseness. Beyoncé doesn't need anyone to tell her how to feel about losing her man, just as she doesn't need to wait for the band to show up. Thus, "Single Ladies" rides along with handclaps, foot stomps and the sometime sound of a spaceship starting to land. End of story. 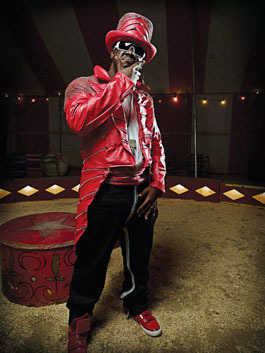 Fellow hitmaker T-Pain, whose legacy is instantly dated by the robot-voice effect he achieves with Auto-Tune software, is the walking definition of a "showy performer." He appears in an oversize top hat, and his videos are colorful expositions of quickly changing fantasy vignettes. But his hit single, "Can't Believe It," glides along with a floor thump, finger snaps and a keyboard you might find at the local drugstore. Like the other razor-pop singles of 2008, it feels as if it'll crash in with an epic chorus, which, of course, never arrives. Who will be the razor-pop sensations of the future? The performers, interchangeable thanks to Auto-Tune, are impossible to predict, but the producers are likely to be a 23-year-old from Atlanta named Terius Nash, a.k.a. the Dream, and his 34-year-old partner, Chris "Tricky" Stewart. Nash and Stewart hit it big last year penning and producing Rihanna's mammoth hit "Umbrella" and have since gravitated toward the whispering power of the tiny, producing both "Single Ladies" for Beyoncé and another very tiny song, "High Price" for Ciara. The pair was also behind Mariah Carey's "Touch My Body," constructed solely from a bass sound of kicking a cardboard box, high-hats, finger snaps and two-note chords played on an analog synthesizer. Nash has a new album due out soon, Love vs. Money, that can't help but make more of a splash than his first effort. Last year, Nash's debut, Love Me All Summer, Hate Me All Winter, was released to absolutely no fanfare in the week before Christmas. It's also an overlooked harbinger of hits to come. "Music is uninspiring right now," Nash remarked at the time of the album's release. "The bar needs to be raised; a creative standard should be set in music. I'm hoping that the real quality in these songs shines through." Quality over quantity—such an idea. In the razor-pop future, it may be all we need.